Move over, lasagna! 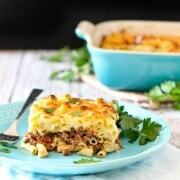 This pastitsio is a Greek baked pasta dish and will wow your family and friends! 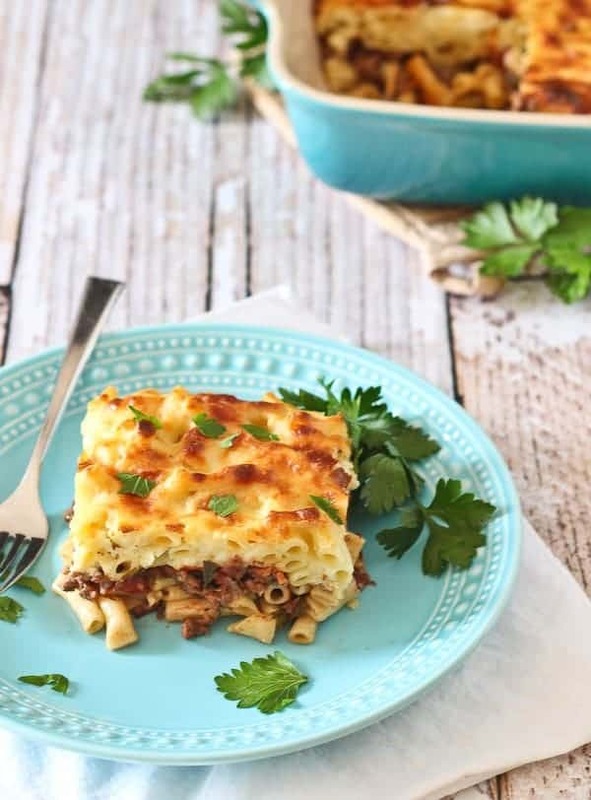 I love trying new recipes, and pastitsio has been on my recipe bucket list for awhile now. Ever since I had some at a Greek restaurant in Chicago, I’ve been dying to give it a try. I loved the layers, the CARBS, the cheese…who wouldn’t love that? When Kathy asked me to help her kick off the launch of her new book and Kickstarter by making one of the recipes out of the “Sunday Dinner” section of her book, my eyes immediately jetted to the Pastitsio. Which I cannot spell for the life of me, by the way. I have to triple check it every time. I’m getting better though! I can’t spell it but I can EAT it. And oh my oh my is Kathy’s recipe delicious. I’m so grateful that I have the chance to share this with you guys. Her cookbook is full of recipes that you can make in an 8×8-inch square pan. I actually doubled the recipe because I had a full pound of ground beef. Which meant we got to enjoy it two nights in a row – bonus! Her book is available through Kickstarter – but she needs backers for publication! You can back her for as little as $5! 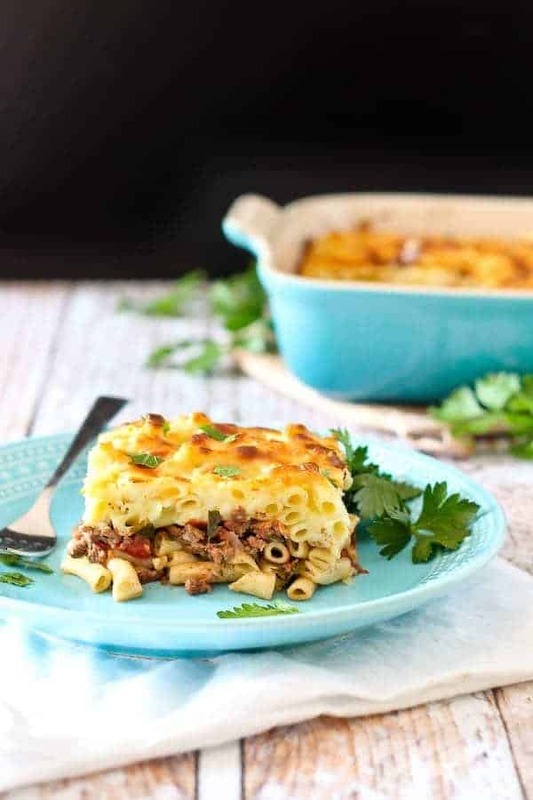 The book not only contains a Sunday dinner section where you can find this pastitsio, but it also has a section for weeknight dinners, side dishes, brunch dishes and of course sweets! 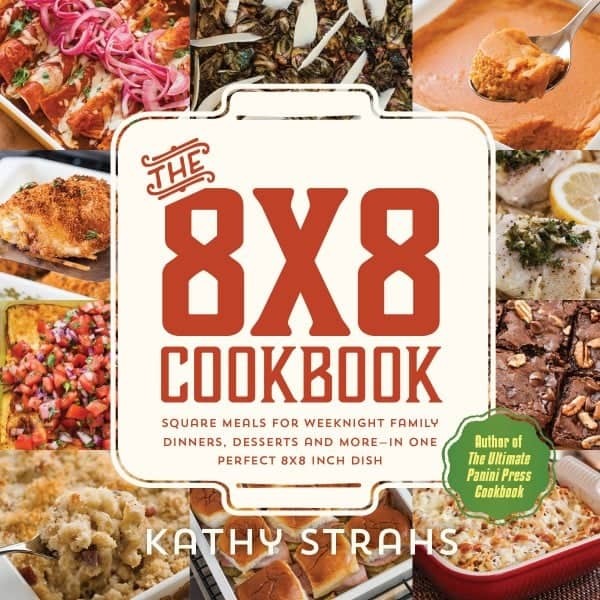 You can find out more about Kathy’s book on Instagram, Facebook, Twitter or by following the hashtag #8x8Cookbook. 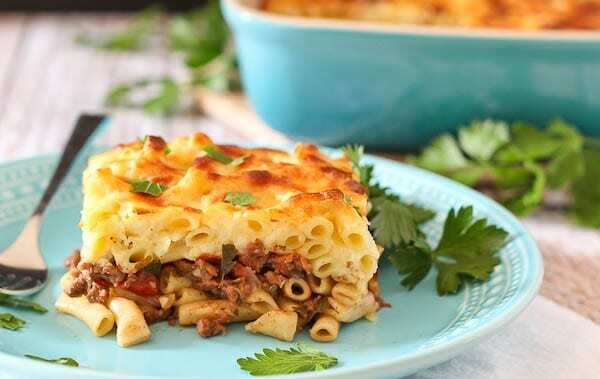 If you don’t know what Pastitsio is, no worries! It’s a Greek baked pasta – you can find special pastitsio pasta but I just used mini ziti. You layer the pasta with a mixture of beef, tomatoes and wine. On top goes a creamy Béchamel which is my absolute favorite part! Kathy uses lots of Parmesan in her Béchamel recipe and it is irresistible! Heat the oven to 375°F. Grease an 8×8-inch glass or ceramic baking dish with butter or cooking spray. Boil the pasta in a large pot of salted water according to the package directions. Drain in a colander. Meanwhile, heat the olive oil in a large skillet over medium heat. Add the ground beef, onion, garlic, ½ teaspoon salt, and pepper and cook, stirring occasionally, until the meat is browned. Add in the wine (and perhaps pour a glass for the cook!) and scrape up any of the bits stuck to the pan with your spoon. Stir in the tomatoes, parsley and another ¼ teaspoon salt, and let the mixture simmer until most of the liquid has evaporated. Remove from the heat and set aside. Transfer half of the pasta to the prepared baking dish, spreading it an even layer all over the bottom of the dish. Next, spread the meat mixture in an even layer on top of the pasta. Finally, top the meat with an even layer of the remaining pasta. To make the béchamel, melt the butter in a medium saucepan over medium heat. Whisk in the flour to form a thick paste and cook, whisking occasionally, until the aroma of the mixture is more nutty than floury, 1 to 2 minutes. Reduce the heat to medium-low and whisk in the milk, then the beaten egg. Mix in half of the Parmesan, and the salt and pepper. Taste the sauce and adjust the seasoning if needed. The sauce should be somewhat thick, like a light custard. Sprinkle the remaining Parmesan over the pasta in the baking dish. Top the Parmesan with the béchamel, spreading the sauce to the edges. The béchamel should form its own layer on top of the casserole. Bake until the béchamel is set and browned on top, 45 to 50 minutes. The casserole will be easier to cut—and see those lovely layers—if you wait for it to cool a bit. *Find pastitsio (aka pastichio) pasta, which is long and tubular, in international and specialty food stores or online, such as on Amazon.com. Bucatini or penne are suitable substitutes. By Kathy Strahs, from The 8×8 Cookbook: Square Meals for Weeknight Family Dinners and More–In One Perfect 8×8 Inch Dish (Burnt Cheese Press, 2015), reprinted with permission. Verdict: Oh my goodness, I loved this! It made my house smell SO good and I loved all the layers. Husband’s take: I wasn’t sure he would like this (I don’t know why!) but he loved it – maybe even more than I did! He took leftovers in his lunch. Changes I would make: None! At all! Difficulty: I’m gonna give this a “moderate” rating. It’s in the “Sunday dinner” category of Kathy’s book for a reason. 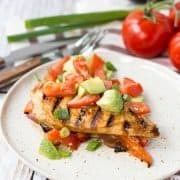 There’s definitely a little extra TLC that goes into making this but if you plan ahead, read through the recipe and take your time, there’s nothing too technically difficult about this recipe. Disclaimer: I was not compensated for this post. I am blogging friends with Kathy and am thrilled to support her in her endeavors. 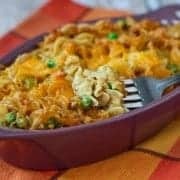 I was given a beautiful pan from Le Creuset to use for this recipe. All opinions are always my own. Looks incredible but every pastitsio recipe I’ve ever made calls for cinnamon. The cinnamon really puts it over the top! 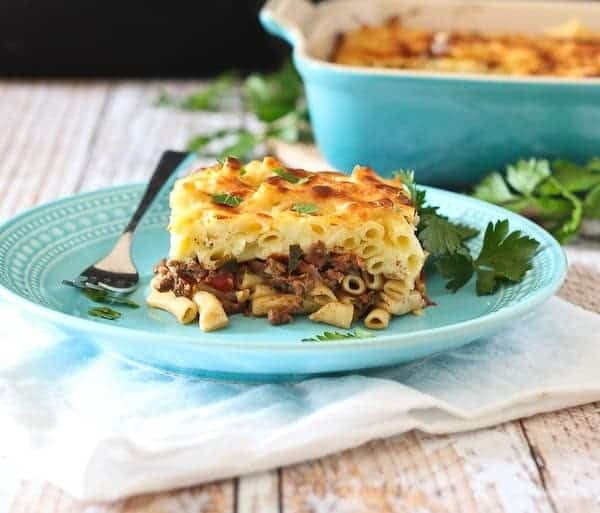 I’ve never heard of this pastitsio – and could never pronounce or spell it again – I totally want to devour it! Your pastitsio came out absolutely amazing! 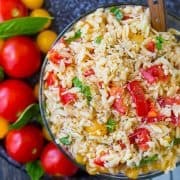 This is one of my husband’s favorite recipes in the book, I am so glad your family enjoyed it as well. Thank you so much for all of your support, Rachel!! Hey Rachel, I actually just made that last week and for the Cyprus feature we were doing for their Independence Day today! I made the Cypriot version called makaronia tou fournou. Same thing except for the addition of halloumi cheese and a little mint. We loved it too! Loving the additions in yours! I’ve made it for a weeknight dinner. Haven’t made it for a while, but we enjoy it!